The Book of Unwritten Tales 2 is a continuation 2009’s The Book of Unwritten Tales While never having played the first one, the humor in the launch trailer quickly snagged my interest. Wish lush graphics, a fun soundtrack, and a story that doesn’t take itself too seriously, The Book of Unwritten Tales 2 was a blast despite the point-and-click genre not being one of my favorites. The game picks up sometime after the conclusion of the first game, but eases new players into the game, slowly explaining the game’s backstory and introducing the cast of characters (a somewhat standard group of a human, elf, gnome, and a bizarre pink creature called “Critter). 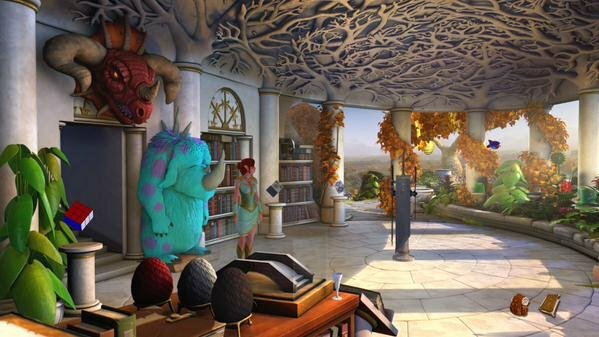 As a point-and-click, The Book of Unwritten Tales 2 requires a lot of exploration and puzzle solving. Trying to speed through the game is supremely hard, and attention to dialogue is almost always necessary as they contain hints on what you need to do next. Despite some of my frustration at solving some of the puzzles, the game is littered with pop culture references, which I found enjoyable. Some of my favorites were during the gnome Wilbur’s first appearance. Wilbur is now an instructor at a school for magic, and while digging through student files, I ran into a “Mario Mushroom” who was reported for jumping on people’s heads and slinging fireballs. In this same level, fireplaces were able to transport me to other parts of the school with the use of “Fireplace travel powder”. Much like the Floo Powder in Harry Potter, this also turned the flames green. While the game’s jokes about every aspect of gaming, from micro transactions and DLC to the fantasy genre is amusing, there were times where the gameplay did feel a bit clunky. There were a few instances where my character wasn’t angled correctly to interact with an item, or where the pathing seems to take me long way to my destination. You’re going to be going back and forth. A lot. You may move on to one room only to find a clue and be required to go back to where you just were. This coupled with the fact that there’s no running makes the game painfully slow every once in a while. Despite all of this, the combination of its music, graphics, and good laughs, The Book of Unwritten Tales 2 is very enjoyable despite the fact it’s not a genre I normally engage myself with. A witty tale of fun!